Lone Wolf and Cub Ultimate Collection DVD Review Highly recommended for fans of Oriental fare, and another hugely worthy addition to Madman’s Eastern Eye stable. 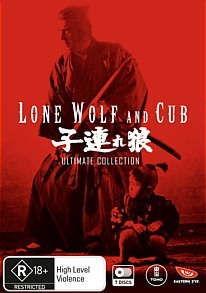 Collected for the first time in a monster 7-disc set, Madman’s new Lone Wolf and Cub: Ultimate Collection brings together all six of the original films plus the 1980 English-language addendum Shogun Assassin. Based on Kazuo Koike’s landmark manga series, Lone Wolf and Cub centres around Ogami, a royal executioner who returns home one day to find his wife murdered by the clansmen of one of his victims. Renouncing his old life for a path of vengeance, Ogami gathers up his infant son and travels feudal Japan as a ronin, a masterless samurai hellbent on justice. Renowned for its stylised violence and pioneering use of special effects, Lone Wolf and Cub proved hugely influential in the West in the decades following its release(and yes, Quentin Tarantino drew upon the series thematically and stylistically for Kill Bill). Replete with multitudinous bad guys, epic battle sequences, expert swordplay and endlessly cool dialogue (‘Now I must walk the path to hell’, ‘The men trying to kill you are three brothers called The Masters of Death. Perhaps you’ve heard of them’) the series reinvigorated the samurai genre and remains a classic of Japanese cinema to this day. The films are presented in a letterboxed 1.85, not the anamorphic 16:9 touted on the back cover, and the transfers are quite sharp considering the ages of the original prints. Audio is a fairly rudimentary single-channel affair across all films. I can’t recall having reviewed too many films with monoaural soundtracks, and the soundscape itself is pretty thin by modern standards, but dialogue is clear enough and the lack of a bombastic audio mix doesn’t distract too much from the onscreen carnage: when Ogami promises to avenge his wife’s death with rivers of blood, he isn’t kidding! Highly recommended for fans of Oriental fare, and another hugely worthy addition to Madman’s Eastern Eye stable.